« No available for public viewing! Fortunately most ads providers (LeadBolt in my case) have provided new SDK libraries that comply with those rules. Previously, all users who downloaded your app - had notification ads enabled by default. With new SDK users are politely asked to opt in for icon and notification ads. They may accept to see your ads or not... It is obvious it made an impact on the number of ads displayed. Many of you are wondering is it still worth to use notification/icon ads? I will try to reply to this question in this post. In my analysis I will use data from my LeadBolt and Admob accounts. I have referred to LeadBolt over seventy users and I see one percent of their earnings as my affiliate commission. Moreover my apps on LeadBolt have about 3 million ads impressions per month that will be compared to same period with AdMob income. Those data let me to see trends based on bigger developers base and compare it to other revenue stream from same apps. Currently I have 72 active publishers referred under my account. On 1st September I had 62 referrers so my income should increase. Unfortunately it didn't. 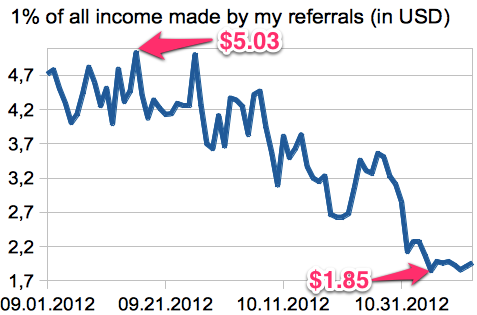 The chart below shows 1% of income generated by all my referrals since 1st September till yesterday. As you may see the trend is lowering. It is hard to tell which reason is stronger. So to see the situation even better let's check my personal stats. Here is the chart with my daily income changes. 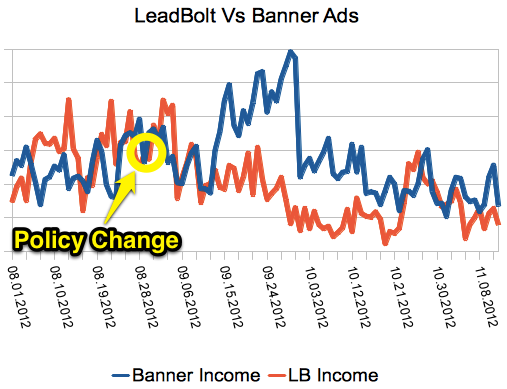 It compares LeadBolt with banner ads from the same apps. I will not publish my income numbers but the total trend graph. I have circled the date when the new Google Policy came into effect. As you may see on the chart shortly after that day, LeadBolt income have slightly dropped. Banner ads had a peak on the same time. But lastly, surprisingly it looks that trends of both are getting very close. It seems that users are getting used to new "policy pop-up" on my apps and more of them are accepting it. Moreover in last month (10.12.2012 - 11.12.2012) the LB income is getting pretty stable and on the same level as banner ads. Just after new Google Policy came into effect - notification ads income have dropped. It is visible on my total referral income as it is represented by over seventy persons. Anyway it still doubles my banner ads earnings so it makes me earn twice as much from the ads! I have always been pretty satisfied from what I make on banners - but making twice of that sounds even better. And what about you? What is your trend? Are you going to keep notification/icon ads? Please share in the comments! I am using Leadbolt as well as Admob. I will keep using Leadbolt because for me September was the best month ever, with more than 200% increase in income compared to August. November is lower though about 30% compared to September but still a lot better than August and normal numbers. Also, steadily, Leadbolt has more income than Admob, for my very high number of impressions. Hope the best for you! Thanks for your comment. Looks that LeadBolt is still doing pretty good. Good luck! Hi, i want to share my expirience too. Why i thing it’s better to use airpush and leadbolt at the same time.. (and it’s showed to my earnings that i am correct, in my case). 1. Leadbolt notifications will not show always in all countries if there are no campaigns from leadbolt publishers for that country.. So Airpush successfuly fills those gaps, i have better chance for my notification to be showed. 2. Airpush can show image banner in notification, so i have one more “type” of notification. One thing that is good in this combination is that Airpush didn’t lowered my leadbolt earnings. So beside adMob and leadbolt notifications/icons i have extra earnings with Airpush. I must say.. Airpush has pretty stable eCPM. so far is $2.60-$3.20 , i am working one month with them. My leadbolt eCPM can vary from $1.40 (yesterday) to $3.50.. When comes to eCPM i Airpush is better… i am just talking for my situation. Thank you for sharing your income data fluctuation, even though you don’t show the actual numbers. That is ok.
I’ve also noticed a decrease in income from Leadbolt. To Harol Jones, how do you manage to use both Airpush and Leadbolt in the same application ? You show both opt-ins ? Won’t that annoy your users ? I agree that icon ads from Leadbolt are much better than icon ads from Airpush, but notifications from Airpush have the best eCPM. I would like to use Airpush notifications along with Leadbolt icons. Do you think it would be ok to use 1 Leadbolt notification, 1 Airpush notification and Leadbolt icon ads in the same app ? I manage to use them in same app in same way as using them separately.. they do not collide or communicate. Airpush is Opted-In with their standard popup window..
leadbold just with popup notification that appears, notify user than fades out..
That process appears only the first time user starts the app.. and last a few seconds.. so it’s not annoying to users.. (maybe it is to some) but my incomes are very good..quite better than using leadbolt and admob. For now i think that this is the best way to pull max income with ads. If someone has better idea i would like to here it. Harold, the problem with your approach is that if you only show the Airpush opt-in and the user does not accept it, then you are violating the Google Policy by showing Leadbolt notifications. It might be a problem, will see. I just did some analizing with ECPM history. I am planing maybe to transfer bigger percent of notifications to AirPush…earnings will be bigger for sure. ECPM.. so we can compare with each other.. I think eCPM for banners rose a bit in September because advertisers were a bit scared from the new policy changes concerning push ads/icon ads and instead did more campaigns on banner networks- I could be wrong, but there seems to be a correlation there. I noticed all banner networks had a huge jump in eCPM in September. Kreci Your blog got me into the idea to develop games for android to get some income. I’ve been making steady income from leadbolt ever since I implemented them. A few things that I would like to say. I make about $150 per month from leadbolt using home shortcut and 1 notification every 4 days starting after 12 hours. I honestly believe that if the quality of the apps improve so will your revenue. It may seem like OK let me push out more ads, even the leadbolt support are telling me that I should push out more notification ads but I’m not really interested in that methodology. I prefer to get better as a coder coming from having zero technical experience. I just want to say you can put out better quality apps. I’ve looked at your apps and the ratings are taking a dive. Why not try to improve the quality of your apps, I know you have the skill to do so. I say this with respect because like I said it was your blog and ebook that gave me the jolt to hop in and give it a shot. This Adblock app of course has thousands of downloads and sky-rocketed in Google Store charts. Why does Google allow that? I am working hard to make good games and have some successes. I only ask to allow that tiny banner in the title screen of my games – is it to much? As far as I found out Adblock alters the devices proxy settings. Maybe we should thinking of some way to “Block AdBlock”? Hi. Just got and idea that we can check in our apps if Adblock package is installed. If it is found we can show a dialog on app start, telling that this app can not be used when Adblock is installed… Or that it locks our app and needs to be removed. If they block us we can block them… I will need to try it and let you know. I have found a code snippet on Stackoverflow that might be of help. Though haven’t tried it yet. AFAIK Adblock alters the proxy port to some address that it uses for filtering the ads. I was wondering that if Adblock may alter these settings, maybe my games could just alter it again back to default settings :) I’ll see what I can do and also let know. By the way I should also thank Chris for an inspiration to start developing Android games. After a year a have a series of word guessing games on Google Play. I am using just admob, because it is relatively easy to pay taxes in Poland in this case (Chris knows what I am talking about). The results that Chris presented in the past have been my inspiration. About my results? Well my games with single admob banner have repaid my mortgage within 6 months. Good link. But they have problems in defining how to detect if the IP was redirected. I think it would be easier to check id packages of known Ad Blockers are found in the system. BTW I am glad I have helped you to build your own income source. Good luck! That is great tip! Thanks! This little snippet finds out whether adblock service is running in the background (works for me). Thanks! I am sure it will be useful for some of readers! Just to recap, yesterday I made some final checks. I looked into Adblock Plus code (it is open source) and found out it really alters the proxy settings on machines with Android 3.1 and later. Then I added a function which just changes the proxy back to system defaults in the onCreate function of my start Activity. And the admob banners were showing up despite the Adblock running, no problem at all. So it seems that it was worth to remember that Adblock is just an app like our apps which means that it can’t do anything to the system that can not be undone with the same access to the system settings. Nice work! It would be great if you could share this code with others. What about writing a short guest post on my blog? Contact me via my form here if interested. Thanks for the info about Adblock. Could you please share your Adblock block code? Hi People , how’s your Leadbolt notification ECPM this days? Mine is lower than usual , worst month ever this December. I cant believe this is happening in holiday season :(. I hoped for much stronger ECPM to be honest. Hi! Since christmas my ecpm for notification ads has increased a lot! About 5$ but is decreasing now again. The funny thing: the app that makes now 50$+/day has only 6000 active installs and been removed from play store due to trademark infringement 3 months ago. Btw until dez24 it made me only 5-10$/day. Would Adblock plus be a problem ?